Pink silk taffeta dressing gown in kimono style with embroidered naturalistic chrysanthemums and butterflies in polychrome silks. Silk plain weave lining, padded hem and pleat in back of robe. Full sleeves gathered at shoulders and trimmed with braided silk cord and tassles. Matching sash of pink silk taffeta with double-sided embroidery of chrysanthemums in green brown and pink polychrome silk with knotted silk fringe. 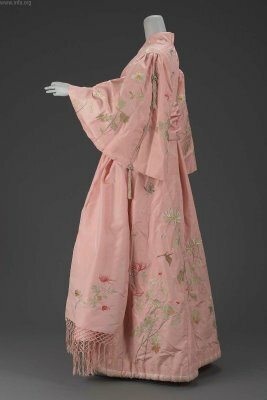 Gown labeled: S. Iida "Takashimaya" Silks and Embroideries. Kyoto.